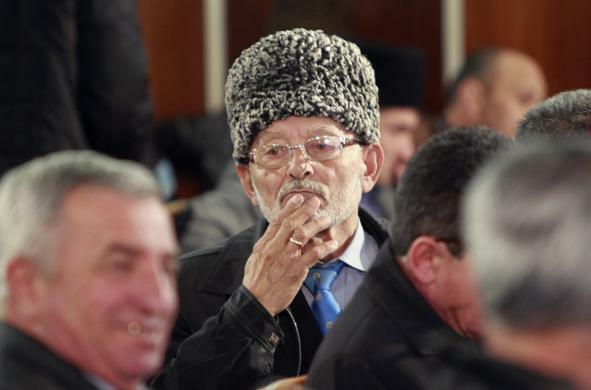 (Photo: REUTERS / Shamil Zhumatov)A delegate attends the Kurultai, the assembly of Crimea Tatars, in Bakhchisaray March 29, 2014. SIMFEROPOL, Crimea, May 18 (Reuters) - Defying a ban by their new Russian-backed rulers, thousands of Crimean Tatars gathered at a mosque on Sunday to commemorate the day 70 years ago the mass deportation of their families began under the orders of Soviet leader Josef Stalin. Waving blue-and-yellow flags and chanting slogans, they rallied outside the mosque on the outskirts of the capital Simferopol as Russian military helicopters circled overhead. The 1944 Soviet-era deportation of some 200,000 Tatars to Siberia and Central Asiakilled many and is a reason for Tatars' deep mistrust of the Russian authorities. Many still associate Moscow's rule with oppression, exile and suffering. "People, homeland, Crimea!" the crowd chanted. One banner read: "Eternal remembrance for the victims of genocide - the Crimean Tatars." Tatar community leaders, including the head of the Mejlis assembly, Refat Chubarov, and Crimea's chief mufti made an appeal to the crowd for unity from a stage in the Ak Mechet district. "We didn't think we'd be marking the anniversary under these circumstances," Chubarov said, "I don't have a solution to our problems, but I know that we will only be respected if we are united." Mufti Emirali Ablaev led prayers for the deceased ancestors of those present and called for dialogue with the region's new leadership. Looking up at the helicopters, Ablaev told the crowd: "They are watching us, they are afraid of us." In a resolution adopted at Sunday's rally, the Tatars called for Crimea to have autonomous status within Russia to protect their rights. The Tatars - who make up more than 12 percent of Crimea's population of 2 million - also demanded laws to guarantee their representation in Crimea's government. The Mejlis had planned to hold a rally on Simferopol's main square but switched locations at the last minute, apparently in the hope that Crimean authorities would not intervene. On Sunday afternoon, the central square was fenced off and guarded by ranks of Russian riot police and pro-Russia "self-defence" units standing alongside armoured personnel carriers. Adding to tensions, Mejlis leaders say officers from Russia's Federal Security Servicehad raided the homes of several Tatars earlier in the week, citing suspicions of "terrorist activity." Crimean Prime Minister Sergei Aksyonov on Friday banned mass gatherings on the peninsula, which Russia annexed from Ukraine in March, until June 6, citing violence insoutheast Ukraine. At Sunday's rally, Lenur, 28, wearing the Ukrainian national team's football strip, said discrimination against Tatars had increased since the region became part of Russiaand that he still considered himself a Ukrainian citizen. "I'll be with Ukraine forever," he said, condemning the ban on mass gatherings as cynical, given that celebrations to mark Simferopol's City Day and the Russia Day public holiday fall in the week after the ban ends. He declined to give his last name. Many Tatars wanted Crimea to remain in Ukraine and boycotted a March 16 referendum in which authorities said nearly 97 percent of voters backed joining Russia. Russian officials including President Vladimir Putin have since promised that Tatars' rights will be respected, but the OSCE rights and democracy group said this week their situation was "particularly precarious" since the annexation.